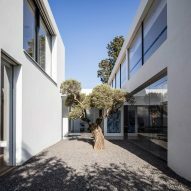 Pitsou Kedem Architects has completed a family home in the Savyon district of Israel, featuring living areas flanked by glazed walls facing onto private courtyards. 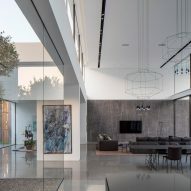 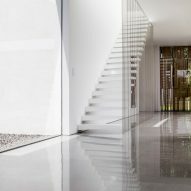 The F House was designed by architect Pitsou Kedem's studio for a plot in the upmarket neighbourhood, which is around 20 kilometres east of central Tel-Aviv. 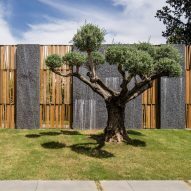 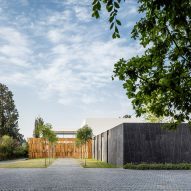 Set within private grounds, the house appears on approach as a monolithic stone-clad volume adjoining a more permeable slatted-timber structure. 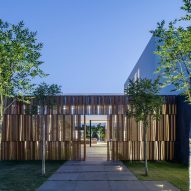 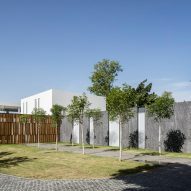 A paved path lined with trees extends from the driveway towards the semi-opaque wooden wall, where a doorway opens into a secluded courtyard incorporating a lawn with a tree at its centre. 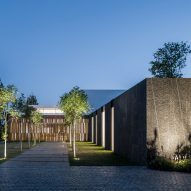 "Walking along the path, as indeed the entry into the enclosed grounds, is part of the process of separating from the outside world and contemplating the present moment more deeply," said the architects. 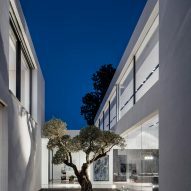 From this point, the house opens up and becomes a series of largely transparent volumes offering long views through the living areas towards further courtyards and gardens beyond. 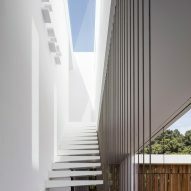 The entrance courtyard is lined with glass curtain walls that present a view into a lounge and lobby, from which a top-lit staircase with floating white treads and a minimal balustrade made from tensile cables ascends to the upper floor. 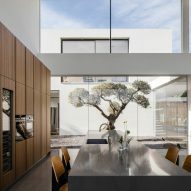 The lounge is incorporated into an open-plan space that also accommodates the dining area and kitchen. 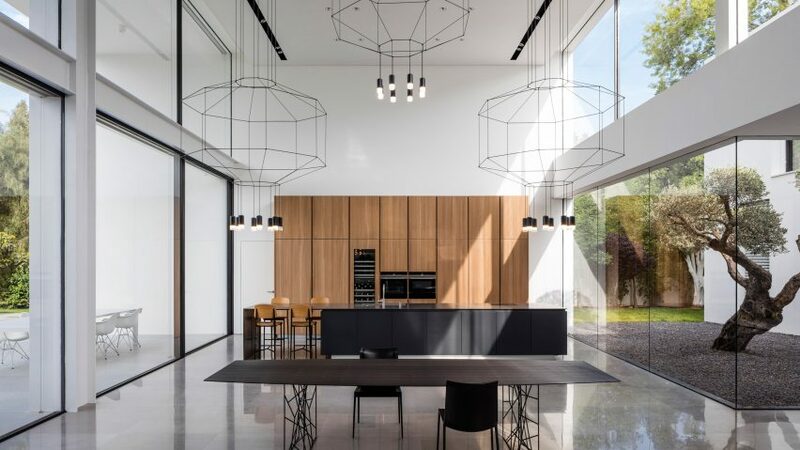 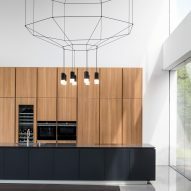 Designer Arik Levy's Wireflow chandeliers for Vibia – which look like line drawings – are suspended from the double-height ceiling to accentuate the height of the room. 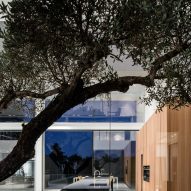 Next to the kitchen is another courtyard containing a tree emerging from a gravel bed. 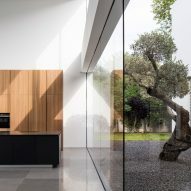 A fully glazed corner creates a seamless view of this external area from the living space. 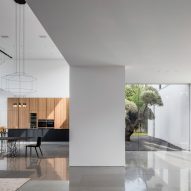 Clerestory windows flood the interior with daylight and frame a view of another lounge space situated on the upper floor of the adjacent block containing the bedrooms. 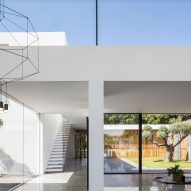 On the opposite side of the main living area, more expansive glazing looks out onto the garden and swimming pool. 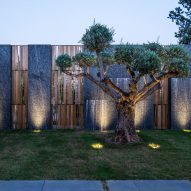 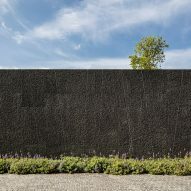 The stone wall flanking the interior space extends out into the garden, where it is divided into slabs. 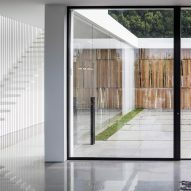 A glass balustrade wraps around the pool to provide a protective yet transparent border. 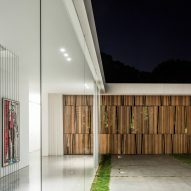 A gym pavilion also features glazed surfaces to create an interrupted connection with the rest of the house. 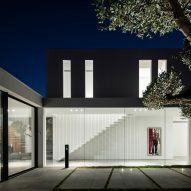 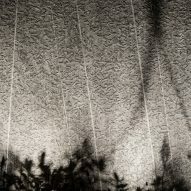 Savyon is also the location of several other buildings designed by the firm, including a house comprising two intersecting volumes intended for family use and partying, and a property featuring patterned screens that cast chequerboard patterns of sunlight and shadow. 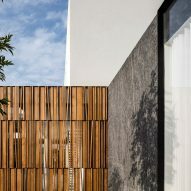 The property's pared-back aesthetic is typical of many houses designed by Kedem, including a Modernist-inspired residence with a cantilevered upper storey and another home reached by a bridge that traverses a verdant garden.